Although the new auto company Elio Motors has struggled financially to move their production forward, Paul Elio still claims the Shreveport, Louisiana plant is 1-1/2 years from production. Those of use who have deposits and reservations and blog about it in are still hopeful, although low fuel prices, advancements in EVs and American’s love of SUVs has us questioning a new high production model 3-wheel car/motorcycle. Personally I still want one and want a new auto company, but see the move toward partnering with a cryptocurrency as a desperate way to raise capital? 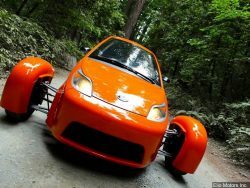 A radio personality Lars Larson had a great interview with founder and CEO Paul Elio last week and it was encouraging. Let’s hope the reality is more than just a money burning dream since too much has gone into this little car to stop now.